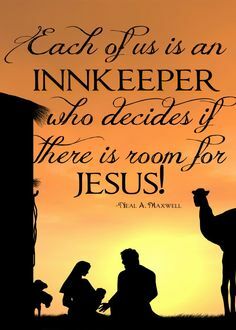 Be the kind of innkeeper who always make room for the Savior! Just a couple more days till Christmas! her baby would be born. But here is Mary, being great with child the Bible says. And they’re still searching for a place to stay. and the things going on in their lives. They had no room for Jesus! This entry was posted in Uncategorized on December 24, 2014 by heavenlyraindrops. Thanks for reminding us about the importance of making room for Christ. Awesome post bless you!